FFE image in a single subject in 1 section of the midbrain at the level of the superior colliculus. The image was passed through a lookup table filter to produce a color-contrast scale. Different parts of the RN and the SN are revealed. Segmentation process by using a region-growing segmentation algorithm28 in the FFE scan. A, Sample section in the midbrain at the level of the mammillary bodies where the segmentation algorithm was implemented. B, Segmented region of the SN traced in red within the midbrain. 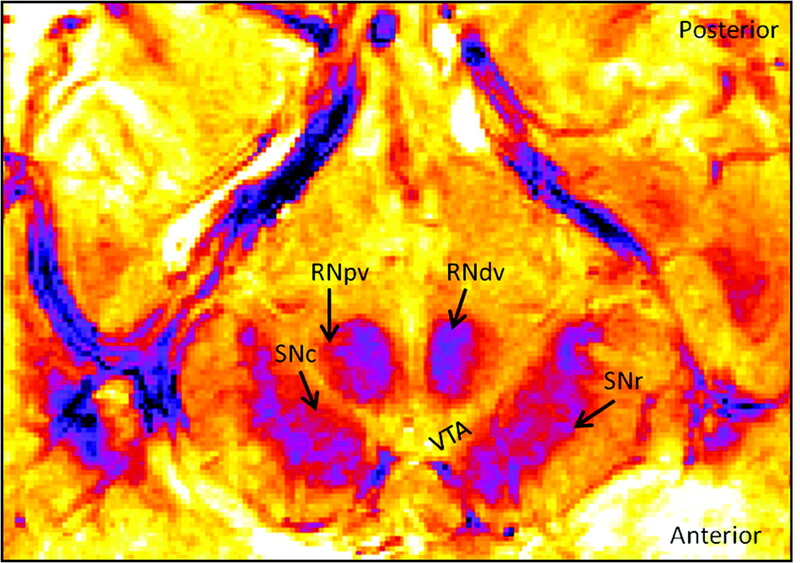 C, Segmented structures (SN is red; VTA, blue; and RN, green) overlaid on the anatomic FFE image. Individual-subject absolute-volume measurement for the SN (A), VTA (B), and the RN (C). Volume measurements for 10 subjects are shown here. Blue dots represent the GRASE scan; and red dots, the FFE scan. The dashed line represents mean volume.